We want to be your car dealer for life! We understand, buying a vehicle can be stressful. We take the hassle out of the process and give you the price of a vehicle upfront. 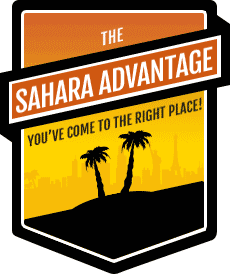 At SAHARA you don’t have to spend hours negotiating. Everyone gets the same No Hassle Price. Sales associates at SAHARA are trained to help you buy the perfect vehicle based on your needs. Not sell you something to hit a commission goal. Our people are paid on fixed compensation regardless of the price of the vehicle they sell you. But, they’re paid even more based on the amount of happy and satisfied customers they cultivate. It’s pretty simple. We want to be your dealer today, but more importantly your dealer for life. A Vehicle Exchange Is Simple! Being one of the fastest growing dealers in Nevada presents a problem – we need quality used cars! If you come to SAHARA, we’ll conduct a free trade appraisal and you’ll be surprised how easy it is to get you into a new or quality pre-owned vehicle at the same or even lower payment. Click here and learn more about the benefits of our Vehicle Exchange Program! We can get you financed. 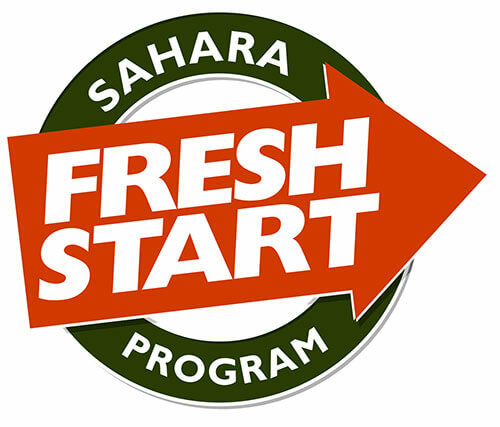 Our Fresh Start Program is designed for real people, with real problems who need real help. Our team offers working customers that Fresh Start at financing every day. Just click here and learn more on how we can get you driving a vehicle you never thought you could afford! Being the fastest growing Chrysler Jeep Dodge and Ram dealer in Nevada means you’ll never have to worry about finding the vehicle you want. Just surf our huge inventory with the easy navigation tool you see to the left. If you don’t find the exact vehicle you’re looking for, give us a call and we’ll find it in a snap! 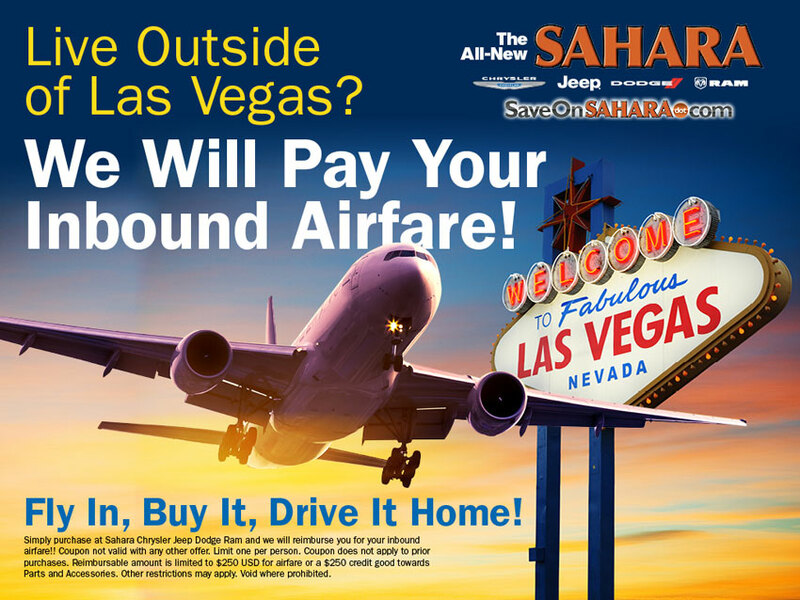 We’ll pay your inbound airfare! Vehicle purchase required. Restrictions apply. Your source for Chrysler, Dodge, Jeep, Ram sales, parts and service at 5050 W Sahara Ave, Las Vegas, NV 89146. With just your contact info we can help you start the new process. Welcome to the Sahara Chrysler, Jeep, Dodge, Ram auto dealership in Las Vegas, Nevada. We offer a well stocked inventory of new Cars, SUVs and Trucks available for sale or lease. Our new Chrysler models include the Chrysler 300 and the new Chrysler Pacifica Hybrid minivan. New Jeeps for sale include the Jeep Compass, Cherokee, Grand Cherokee, Renegade, Wrangler, Wrangler JK and Wrangler Unlimited. Our Dodge dealer lineup includes new Dodge Challenger, Charger, Durango, Grand Caravan and Dodge Journey models. Also in stock is a selection of new Ram trucks for sale such as the Ram 1500, Ram 2500 and ProMaster City cargo vans. Many of our new vehicles are available with dealer specials or factory incentives so you are sure to Save on Sahara when you buy from us. Beyond our selection of new cars, SUVs and trucks, we are also a Used Car Dealer offering a variety of used cars and certified pre-owned Dodge, Chrysler, Ram trucks and Jeeps for sale in Las Vegas. Our selection of pr-owned cars for sale frequently includes used Jeep Grand Cherokee, Jeep Patriot, used Dodge Durango, Dodge Grand Caravan and used RAM 1500 trucks. Chrysler, Jeep, Ram and Dodge financing or leasing is available at our auto dealership in Las Vegas. We can help you buy or lease a new vehicle or finance a used car with affordable payments. If you have less than perfect credit or no established credit we offer a variety of bad credit car loans and no credit auto financing options. Our auto financing experts can also help you take advantage of any factory incentives and current Jeep, Dodge, Ram or Chrysler special offers, so you are sure to get the lowest price on new or used cars or trucks for sale. The Sahara Chrysler, RAM, Dodge and Jeep dealership service and repair center is staffed by certified technicians who perform all types of auto maintenance such as Oil Change, Battery Checks, Tire Rotations, Brake Inspections, engine service, as well as more extensive auto repair. We also offer genuine Chrysler, Dodge, Jeep and RAM truck parts and accessories department and can help you locate specific auto parts for your vehicle. Our Chrysler, Dodge, Jeep and RAM dealership is conveniently located in Las Vegas and proudly serves the neighboring communities of Henderson, Spring Valley Mesquite, North Las Vegas, Boulder City, Pahrump and Paradise, Nevada. We invite you to stop by, meet the team and take a test drive soon.